Aerojet Rocketdyne set the record for the highest chamber pressure of any United States-produced liquid oxygen and kerosene main combustion system during a Feb. 22, 2017, test at NASA’s Stennis Space Center in Mississippi. The new record was set during a series of successful test firings of the AR1‘s staged combustion system. This particular test combined the engine’s preburner with the main injector in order to validate injector design parameters and performance. 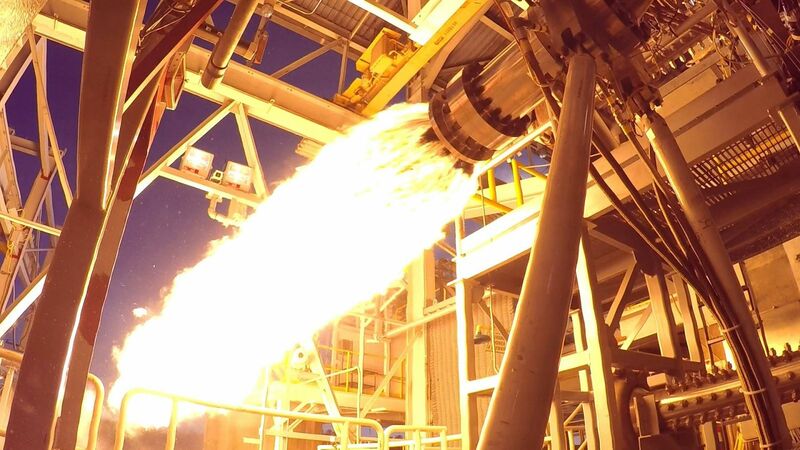 “Staged-combustion testing is a critical step in proving our design for AR1 and reestablishing U.S. preeminence in hydrocarbon space launch propulsion,” said Aerojet Rocketdyne CEO and President Eileen Drake in a press release. Drake said Aerojet Rocketdyne has been working on the engine program since 2014 and remains on target to deliver a flight-qualified engine in 2019. “The latest testing validates our flight design and provides high confidence as we move further into AR1 engine manufacturing,” Drake said. Both Aerojet Rocketdyne with its AR1 and Blue Origin with its BE-4 engine are working toward developing oxidizer-rich staged-combustion engines to end U.S. reliance on Russian-made RD-180 rocket engines. Establishing independence from the Russian engine is becoming increasingly important as relations between the two countries remain strained. “AR1 is the lowest risk, lowest cost and fastest path to end U.S. reliance on Russian engines for the launch of America’s national security and civil space missions,” Drake said. The AR1 is a 500,000-pound (2,200-kilonewton) thrust-class liquid-oxygen/kerosene engine and is slated to be completed in 2019. Note the specific qualifiers of this record, “kerosene” and “made in the US”. Since the only kerosene engines produced in the US so far have been open-cycle, this isn’t saying much. The AR-1 is still lower pressure than Russian kerosene/LOX engines, and if you were comparing to US engines and expanded the fuel type even just to “hydrocarbon” the AR-1 would be blown away by the Raptor. This “record” is just clumsy PR. How do you know it is lower pressure than RD-180? The press release does not say what the chamber pressure was or even the previous record. Yeah. “Highest chamber pressure ever achieved” without telling the actual data. But for U.S kerolox engine there would be only (so far as i know) Merlin engines to beat. If they could beat the RD-191 for chamber pressure they would be using two qualifiers where one would do. Thus we can infer, despite the lack of specific figures, that they cannot. Even BE-4 is planned to clock iin at lower Pc than RD-180/RD-192. Only Raptor is planned to beat it at full scale. They do not make a comparison to the SpaceX Merlin D engine, and story has zero data. No numbers = no credibility. Competition with the Russians is good. It motivates the USA. The USA will have the best engines soon. I cannot help but wonder what the article picture is showing. Is that the AR-1 chamber without a nozzle? It seems to be a rather odd shaped combustion chamber. It looks more like an over firing gas generator.